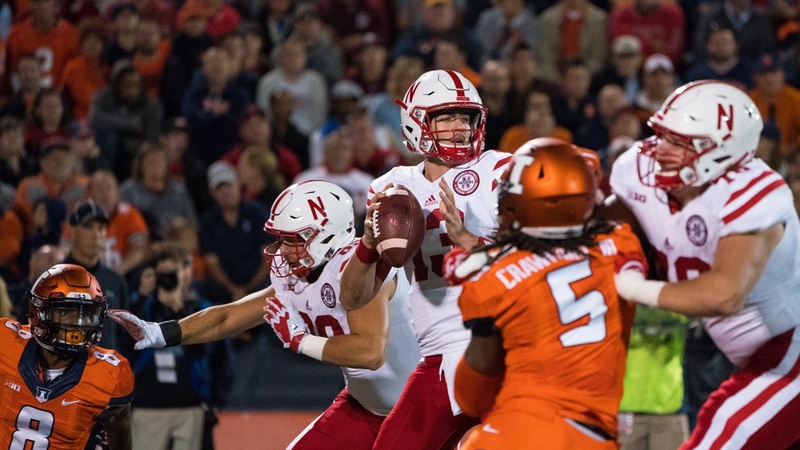 CHAMPAIGN, Ill. – Nebraska quarterback Tanner Lee needed to have a strong showing under the road lights in Illinois. Not just because the Huskers needed better balance after throwing for just 109 yards in an uneven victory over Rutgers a week ago. No, Lee needed to silence the noise outside the program suggesting that he wasn’t the right quarterback to lead this Nebraska team. “Now, hopefully everyone sees why he’s our quarterback,” receiver JD Spielman said after Lee led the team to a dominating 28-6 victory over the Illini. The fifth-year junior completed 17 of his 24 passes for 246 yards and three scores. More than the passes that he connected on, though, Lee’s improvement was seen in the ones he missed. Seven incompletions. None of them were interceptions. Three of them were drops from receiver Stanley Morgan Jr. and two of them were throw-aways. Lee had one brain fart on a pass to tight end Tyler Hoppes that floated in the air just a second too long and an Illinois defender made a play on the ball. Fortunately for Lee, Hoppes showed off his defensive chops and knocked the ball away (Hoppes joked after the game he wanted credit for a pass break-up). There was also the one misfire on his first attempt of the game. Add it all up and Lee had his most complete game of the season for the Huskers. In the second quarter, Lee went on a stretch in which he connected on 10 consecutive dropbacks. Spielman said it was a culmination of everything coming together for the Huskers’ offense at the right time. Receivers did their part to get open and, for the most part, made the tough catches a quarterback needs his guys to make. The offensive line provided Lee a clean pocket to work in almost all night long. He was sacked twice, but one of those Lee took because he had nothing downfield. “If we don’t show up, I don’t know how he’s going to be able to showcase himself well,” guard Jerald Foster said. Showing up was a goal of the offensive line’s. They’ve heard the negativity surrounding Lee for three weeks now, they’ve read that he isn’t getting it done and they’ve listened to people say it might be time to move on to the next guy. But Foster said they knew what Lee was capable of and they just had to let him show it. Spielman said the same. “I’ve seen him like that throughout all of practice, throughout all of fall camp,” he said. “We just had to give him a chance to be able to make those plays. The wideouts had to be able to get open, the o-line had to be able to hold their blocks and when we all did that it really showed Tanner’s potential. His teammates and his coaches say Lee just shrugs off the noise, keeps his head down and goes to work. Spielman said Lee approached this past week of preparation the same way he approached the week before and the week before that, and will do the same moving forward. Lee calls it winning the week. “I’ve been just straight-line focused on our next opponent and how I can help our team the best to win that week,” he said. Langsdorf said it’s a performance Lee and the offense can build on moving forward. With a visit from No. 10 Wisconsin on the horizon, Langsdorf sees a few areas where the Huskers can improve, but Lee’s teammates feel like tonight’s win offered another glimpse of what this offense is capable of if Lee is firing on all cylinders.